Carbon neutrality is a prerequisite to stabilising global temperatures. Until human-induced net greenhouse gas emissions are eliminated altogether, the concentration of CO₂ in our atmosphere will continue to rise, making it impossible to halt global warming. Defining the concept of carbon neutrality is easy enough at a global scale: it is defined by a state of equilibrium between global carbon emissions and global carbon sinks. When it comes to individual companies, which represent just a small fraction of humankind and its activities, however, defining this goal becomes a much more complex issue. Whether they have already achieved it or are simply working towards it, many companies are now aiming to be carbon neutral. Today, in the absence of a globally accepted methodology, everyone has their own understanding of what it means to be individually carbon neutral. Unfortunately, without a common definition of this objective that is aligned with the Paris Agreement, it is difficult to legitimately appreciate efforts that are being undertaken to achieve this neutrality. There is now a very real need for the development of a generalised framework that could serve as a basis for an ambitious, harmonised and scientifically robust vision of neutrality. Ideally, this framework should be able to be adopted by any organization, regardless of its size, its sector or industry or of its previous experience in dealing with climate-related issues. Net Zero Initiative is a unique network of companies working to define what a challenging corporate carbon neutrality is. 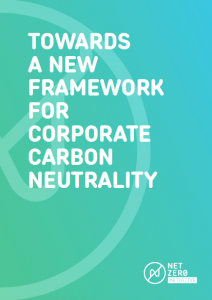 Its n°1 objective is to create the best possible framework and methodology for defining and encouraging corporate carbon neutrality. This publication is the result of a work lead between june and december 2018 by Carbone 4, in tandem with the following partners companies : Remade, Orange, EDF, Groupe RATP, Havas Paris, Groupe BPCE, Engie. The project was supported by a top-level scientific council including the following: Benoit Leguet (I4CE), Marion Verles (Gold Standard Foundation), Jean-François Dhôte (INRA), Olivier Boucher (Laboratoire de Météorologie Dynamique), Dimitar Nikov (MTES/DGEC), Michel Colombier (IDDRI), Anne Bringault (CLER/RAC), Minh Le Quan (independent), Richard Baron (European Climate Foundation) and Laurent Piermont (CDC).